For most of my playing I use custom Steve Clayton Acetal Small Teardop 1.52mm picks with a Dopefish Lives! graphic. Acetal resin is one of the best sounding materials I’ve found, with a solid attack, low noise, and round sustain. The tip on the small teardrop is slightly rounded which gives it a softer attack than the sharper point on typical jazz profiles. This pick isn’t manufactured with a bevel, but will develop the perfect angle after a few hours of playing. Sometimes I use the Black Raven version of this same pick. The different resin is slightly warmer and it has almost no pick noise. While it doesn’t have the subtle variations in timbre of acetal, Black Raven can’t be beat for a dark, consistent tone. With heavier distortion, I use a Dunlop Jazz III. The sharp point offers great articulation but sounds thin on clean tones when compared to the Claytons. There is a slight variation between the red, black, and Eric Johnson signature versions of this pick. I find the plain red slightly warmer, the Eric Johnson articulate but a little too bright, and the black a nice balance between those two. On occasion, I’ll use a Dunlop Jazztone 208. It’s a very thick pick (~3mm), which gives precise control and the ability to be very loud. It also has a sharp point, but the thicker material means it has a warmer attack than a Jazz III. I find I use the 208 for extremes, hard and loud Manouche jazz or light and controlled shred. On acoustic guitar I change picks often. 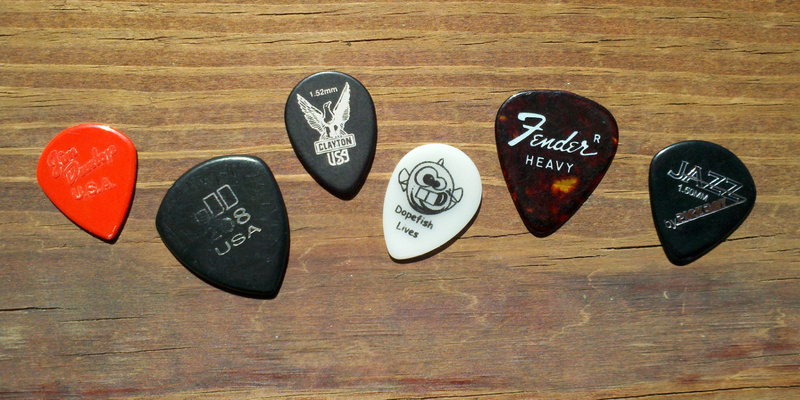 Typically I’ll use some kind of Clayton Ultem pick for flatpicking and a Fender 351 for strumming.